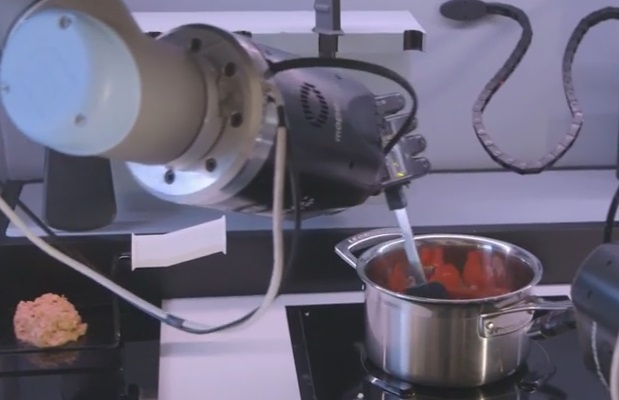 A pair of robot hands could soon be found in every home, able to stir, pour and bake its way to creating meals for their human owners, following the launch of a new robo-chef prototype this week. Creator Moley Robotics says that when the commercial version launches in 2017 users will be able to select one of 2,000 dishes from their phone and the robotic hands in the automated kitchen will make it. At present it’s able to knock up a crab bisque, which it creates by replicating the exact movements of a professional chef. If the robot is successful, it could mean we can simply tap a button on our phone to have a meal prepared in time for us coming home from work. Everything in the automated kitchen has been designed and built from scratch. This allows the hands to be able to pick up and put down utensils, stir food a pan, and then safely turn a hob to the correct temperature. The robotic hands, which are notoriously difficult to create, use 20 motors, 24 joints and 129 sensors to create the same range of movements that a human hand can make. The goal is to produce a consumer version costing £10,000. Shadow’s Rich Walker believes his robotic appendages will ultimately cope with some of the uncertainties of cooking, such as when beaten eggs decide to peak.